Next in the series on Timberline Smokehouse is this Sweet Mountain BBQ variety. See my previous reviews of their Original and Beer & Garlic varieties. Timberline Smokehouse is a brand of Timberline Smokehouse, Inc., based out of Johnstown, PA. The company was founded by Adam Thomas in 2008. Thomas had previously founded Thomas Smoked Meats, a store also located in Johnstown, PA where he continues to sell his line of meats, steaks, chops, sausages, as well as jerky. He wanted to go national with his meat snacks, and decided to launch the "Timberline Smokehouse" brand. As far as I know, the jerky under the Timberline Smokehouse and Thomas Smoked Meats brands are the exact same recipe. Beef, barbecue sauce, brown sugar, sugar, soy sauce, seasoning (salt, sugar, hydrolyzed soya protein, spices, sodium erythorbate, spice extractives, sodium aluminosilicate), water, salt, deyhdrated garlic, paprika, monosodium glutamate, sodium nitrite. The first thing I taste from the surface of these pieces is a strong sweet flavor, followed by a light tanginess, and a garlic flavor. The chewing flavor brings out more definition from the barbecue sauce, along with a bit more saltiness, and a faint spicy tingle in the back my mouth. For being labeled as "Sweet Mountain BBQ", it definitely is sweet. I'd say that's the flavor element that seems to dominate this jerky. It's right there as the first flavor I taste off the surface, and continues throughout the chewing. The BBQ part seems justified in that does have a BBQ sauce flavor, but it's not really that bold, tangy, in-your-face flavor that one would expect with barbecue sauce. It tends to play second-fiddle to the heavier sweet. The natural meat flavors tend to be light in this jerky, less noticeable than Timberline Smokehouse's "Beer & Garlic" variety, but still just noticeable enough that it helps create a bit more snackability for me. However, I noticed a fatty flavor in some pieces of this jerky, which was backed up by some chewy wads of tissues I found while chewing. 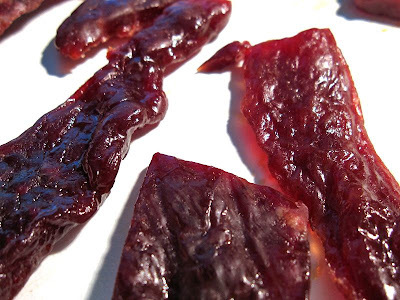 The garlic also plays an active role in this jerky providing a light overall flavor, but still easily noticeable, more so from the surface flavor. The saltiness seems to be a light-to-moderate intensity. Overall, what you're going to notice the most in this jerky is a heavy sweetness, with the barbecue sauce sitting behind that, and the garlic behind that. The natural meat flavors very light, but still noticeable enough to add some additional snackability. These are slices of whole meat, sliced to a medium to thick thickness, and in small pieces. 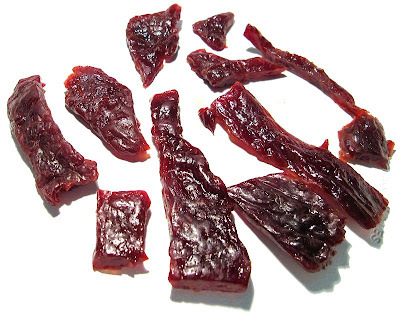 This is a moist jerky, with a good deal of surface moisture/oiliness. Some pieces are very moist, while others are borderline semi-moist. It's seems easy to bite off chunks, and easy to chew. The chewing texture starts off feeling stiff, but quickly breaks down with just a little bit of biting and sucking. It chews down to a soft mass easily enough, and at that point, feels very much like chewing a real piece of steak, comparable to one cooked medium. Looking at these pieces I don't see any visible chunks of fat, but I do taste a fatty flavor on some of these pieces, and I do find some chewy wads of tissue, perhaps tendon, or gristle. It's also a little messy to eat with the moisture/oiliness getting on my fingers everytime I handle a piece, but that just seems to come with the territory with a moist jerky as this. Timberline Smokehouse sells this Beer & Garlic variety at a price of $9.00 for three 1.75oz packages. If you spend more than $25.00, the shipping is free. I bought $36.00 worth, encompassing several of their varieties. That works out to a price of $1.71 per ounce. 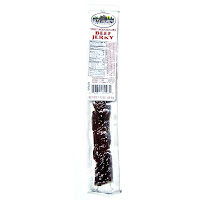 For general jerky snacking purposes, at the $1.71 price per ounce, this jerky seems to provide an excellent value. I'm getting a lot of snackability for its good overall flavor, easy eating, and steak-like chewing texture. The price per ounce is actually the same as the mass-market brands you find in the grocery store, but yet you're getting a much higher quality jerky all around. As a "Sweet Mountain BBQ" variety, at the same $1.71 price per ounce, it's a good value. I get a lot of sweetness from the surface flavor and all throughout the chewing, and I do get a good deal of BBQ sauce flavor, though not the bold, lively flavor you'd expect with a BBQ sauce. But throw in that moist, steak-like chewing, and it's comparable to snacking on a piece of BBQ flavored steak. This Sweet Mountain BBQ variety from Timberline Smokehouse offers a very sweet overall flavor with a taste of barbecue. I get a noticeable yet light garlic flavor, and a lighter natural meat flavor. Together it creates a very enjoyable chew. The meat consistency and chewing texture is quite good being soft and moist, and feeling as if I was eating an actual steak. I did find some unchewable wads of tissue in this meat, which was in contrast to the Original and Beer & Garlic varieties I reviewed earlier. But overall, it seems to pale in comparison to this jerky's strengths. When evaluating a jerky for a "best" rating I look for something that creates a "wow" factor, and while this jerky is indeed very enjoyable, I didn't quite find that eye-opening "wow". Perhaps a bolder, tangier, BBQ sauce is all that's needed.